School is out, the pool is open, and life is good! Living on Jefferson Street as I do, right by the entrance to the pool, bike and pedestrian traffic has already increased dramatically for the season. We have one of these new bike signs painted on the street in front of our house, and I’m sure you’ve noticed them around too. But what do they mean? 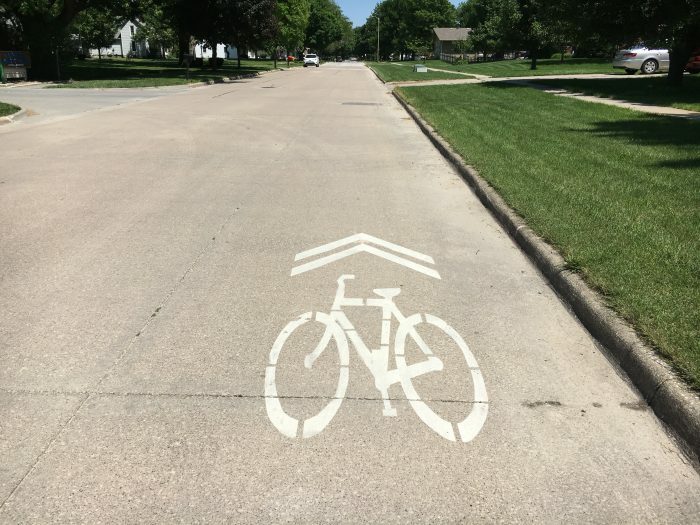 These are called “sharrows,” and they indicate Winterset’s Bicycle Shared Lanes. I checked in with John Pletchette, director of the Winterset Parks & Recreation Department, for the scoop. 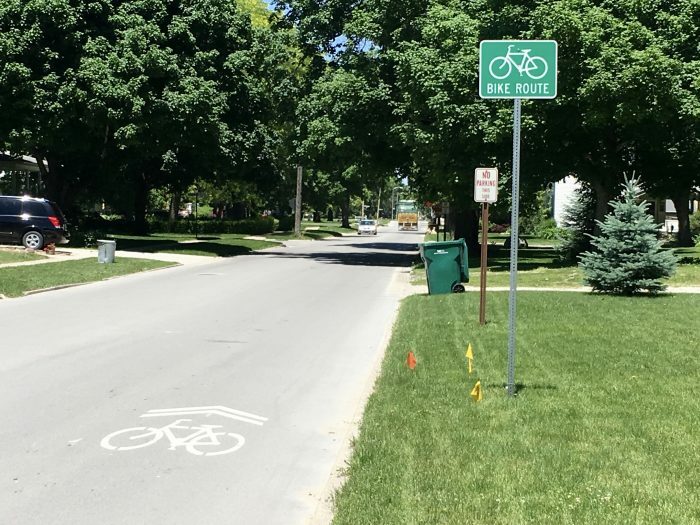 He told me that the purpose of the shared lane markings and signs are to encourage more residents and visitors in Winterset to ride their bikes on city streets and walk on the adjacent sidewalks. The 136 shared lane bike symbols (sharrows) that have been painted in white on the streets, and 20 signs, should also provide more safety for riders and walkers. Marking six miles of shared lanes on our city streets was Phase I of the Cedar Lake Community Trails Plan. It’s just a small start to the overall plan, but very important because it is the official start of becoming a biking/walking-friendly community. The $11,100 total cost of planning, the initial painting of the bike symbols and installing the signage was funded by two grants, including $6,500 from the Greater Madison County Community Foundation. The project involved numerous meetings and discussions, and eventually included a hired consultant from Shive-Hattery to provide knowledge on the technical aspects of shared lanes and finalizing the marked route. 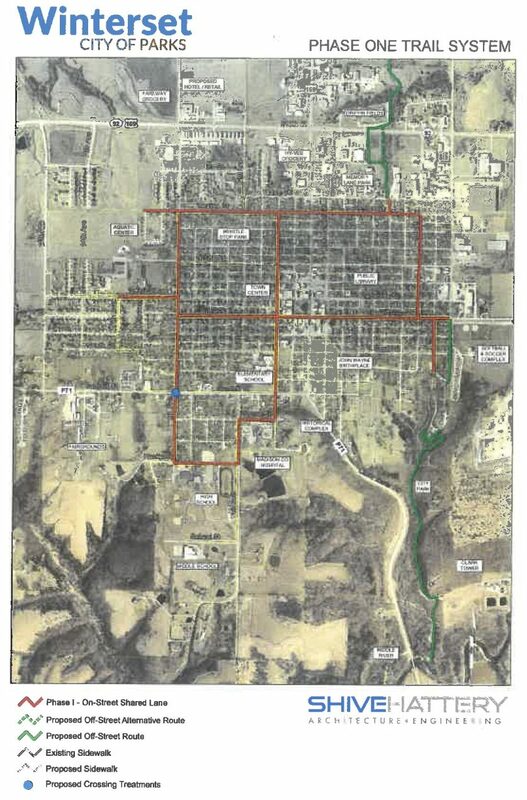 Future work on the Cedar Like Community Trails Plan will include finishing Phase I with some future connector trails; Phase II, re-locating the historic 1911 Jurgensen Bridge from eight miles east of town to the new spillway at Cedar Lake; and Phase III, constructing a hard surfaced trail from Winterset north out to Cedar Lake. Planning continues on these phases. A lot of progress has been made, including a $500,000 grant from the State Recreation Trails Fund. Mayor Olson encourages bike safety during the annual Mayor’s Bike Ride. That’s the brief background, but it brings us back to the question: What do the bike sharrows and signs mean? Pletchette explained that the shared lanes will mean different things to different users. They may provide a designated route to specific locations such as City Park, aquatic center, downtown, and schools. Also, if you’re interested in such things, they provide a loop to do several miles of riding in town with minimal stopping. The designated route provides many level streets of longer stretches with fewer turns and less stop/yield signs. This map is a little fuzzy, but it gives you the overall idea. For those that are interested in riding/walking the route, the simple explanation of the in-town shared lane routes is: north-south on 8th Street, 2nd Ave. and 8th Ave., and east-west on Husky Drive, Court Ave., and Benton Streets, plus a few short routes on adjacent streets. Riders of all ages are encouraged to RIDE RIGHT. Always wear an approved helmet. Stop at all stop signs and yield signs. Be on the lookout for vehicles. Only ride on city streets where you feel comfortable. Parents need to work with youth and designate specific routes and times of day to ride. Routes should be determined by age and skill level. For example: a younger child should not ride alone through downtown Winterset during the day, but choose a route around the square or walk the bike a few blocks. Many participants have already registered, but pre-registration is not required. On-site registration begins at 8 a.m. at City Park’s North Shelter. 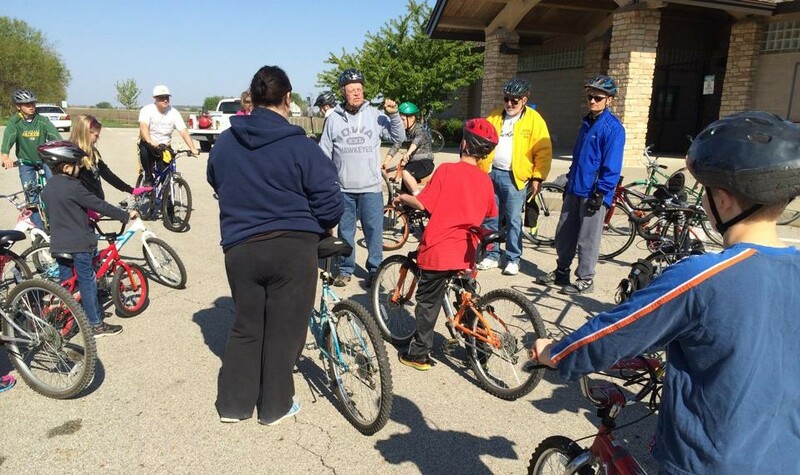 Riders head out as a group at 9 a.m. Click here for a registration form with contact info. Madison County Cycle Club is among the local supporters of the new Cedar Lake Restoration and Trail Project. Proceeds from this year’s BRAMCO will be donated to the Cedar Lake Trail project. The paved routes go south from town on John Wayne Drive. Riders can choose either a 45-mile or a 60-mile loop, returning to City Park for the famous lunch included with registration. Towns on the shorter ride are St. Charles, Truro, and East Peru. The long loop includes Podunk Center and Macksburg. Three rest stops along the route, staffed by MCCC members, provide water, snacks, and shade. Motorists are asked to watch out for cyclists on the routes through early afternoon. 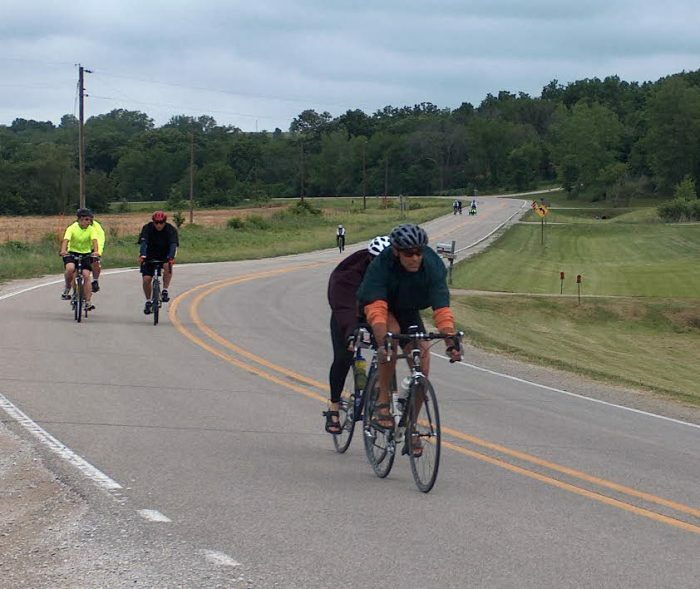 The route for the gravel ride includes three covered bridges, a rural one-room schoolhouse, an open house with the local parachute club at Winterset Municipal Airport, a stop at the new Winterset Cidery, and more. Registration fee for BRAMCO is $35, which includes a commemorative T-shirt; morning coffee, fruit, and muffins; water and cookies at the rest stops, and lunch served at City Park until 3 p.m. Doc’s Soft Water of Winterset provides purified water for BRAMCO each year. HyVee donates bananas and oranges. MCCC’s hospitality and outstanding meal, which includes grilled brat burgers and hamburgers with grilled onions and fixings, pasta salad, and homemade cookies, are famous with area cyclists. 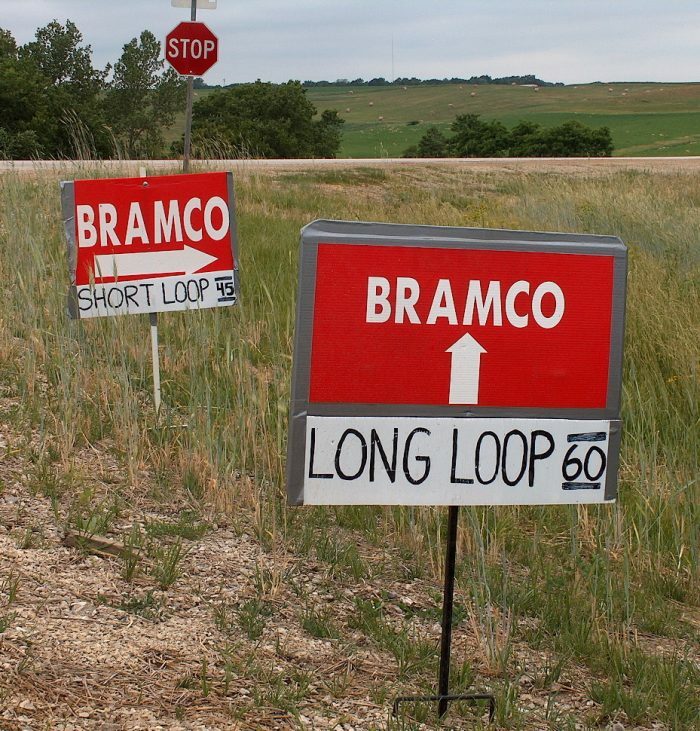 BRAMCO is considered by many the best club-sponsored ride in Iowa. For more information about Madison County Cycle Club, visit madisoncountycycleclub.org. The City of Winterset asks that you please continue to share your good and bad experiences biking and walking in Winterset. They appreciate your comments and feedback. Understand that the shared lane concept is a work in progress. These first painted sharrow symbols will maybe last one year. They will likely be re-painted, routes may change, some may be eliminated, and others added. Call the WPRD (Winterset Parks & Recreation Department) at 462-3258, or email John Pletchette at jpletchette@cwmu.net. Thank you for reading The Winterset Citizen!